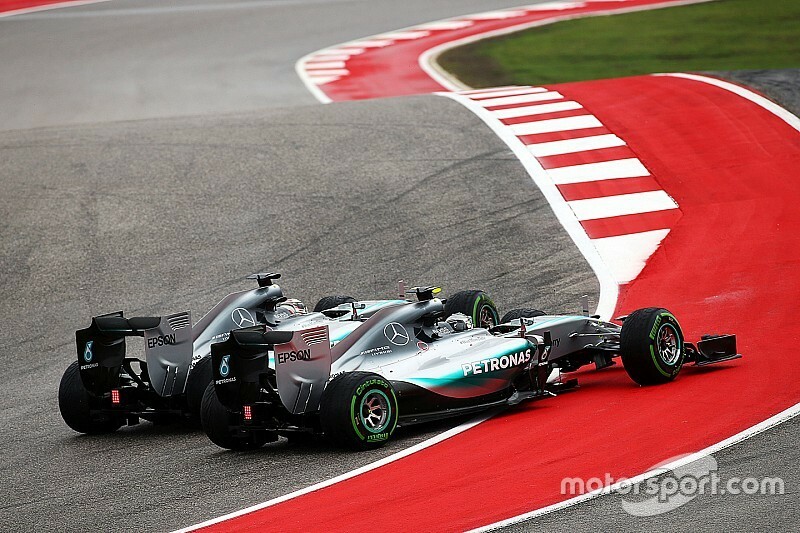 Lewis Hamilton insists he did nothing wrong at Turn 1 of the United States Grand Prix, despite the controversy caused when Nico Rosberg was forced wide. The two Mercedes drivers came into contact as Hamilton ran out to the kerb, in a move that Mercedes bosses say was 'too hard'. Talks between management and Hamilton about what happened will take place before Mexico as the outfit bids to calm tensions between its drivers. But Hamilton has brushed off any suggestions that he went too far in his quest to grab the lead. "I didn't try and push him hard, it wasn't intentional," said Hamilton, speaking after watching what happened on television. "I just watched the replay, we were both on wets and the outside is always the grippier side. So Nico had the grippier line, but I was ahead, so it was my line. "We went in and I started to turn but I understeered into him. He steered round and we touched. "I don't feel like I was aggressive, but at the end of the day I was on the inside so it was my line. "Of course there are always those comments that come up but I would never intentionally do something like that to my teammate." Despite Mercedes bosses Toto Wolff and Niki Lauda saying they intend to have words with Hamilton about what happened, the Briton is unmoved by the fact others are unhappy. "Everyone has a right to their own opinion, but it doesn't matter because I won the race so I feel pretty good about it," he said. "I don't go to finish second. "Growing up, as a family, we never had anything handed to us. Today, absolutely we fight for position in turn one but we went in so quick and I was on the inside, so we touched. "Fortunately no-one had any damage, Nico got back to the lead, but I was going to take him anyway. Somehow I was going to get past him in those ten laps, so I generally disagree with him."